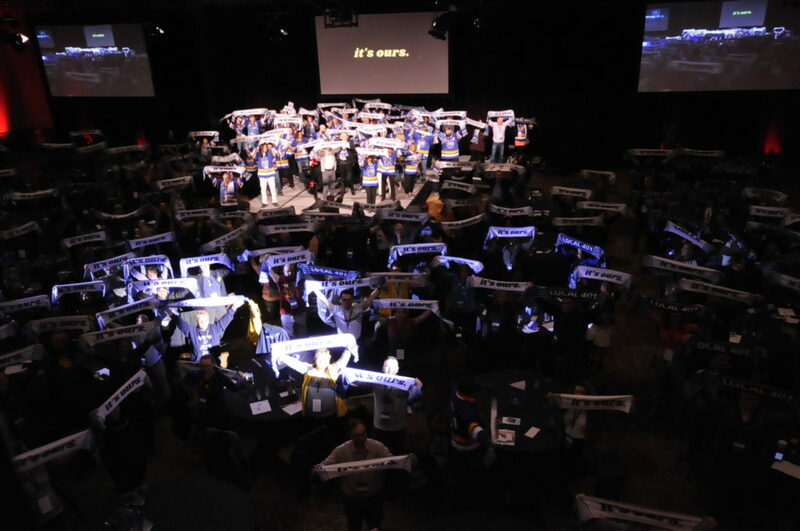 An electrifying feeling filled the room as 300 UFCW members held soccer scarves above their heads and chanted, “it’s ours.” The It’s Ours Members’ Conference, hosted by UFCW Local 401 in Calgary over March 14-17, 2019, infused powerful and dynamic presentations, talks, and plays created and delivered by union members with energetic and impactful public actions. It was more than a conference. The name “it’s ours” was an invitation for UFCW Local 401 members to see their union as something shared collectively, as something that belongs to them. From its inception, this conference was planned to be like no other. 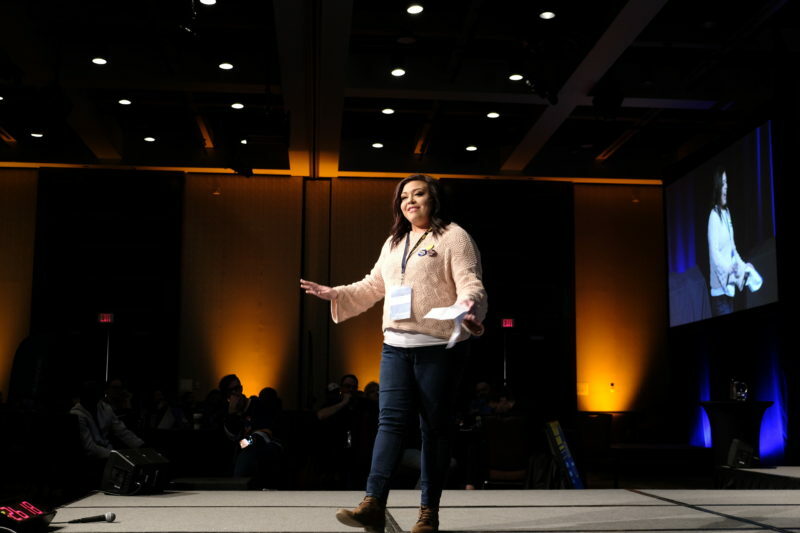 Under the guidance and coordination of UFCW Local 401 Northern Director, Richelle Stewart, a grassroots approach to the conference was envisioned well in advance. The Workplace Engagement group uses theatre to ‘wow’ participants to their workshop, depicting UFCW battles that have defined Local 401. Over one thousand applications were received from UFCW Local 401 members wanting to attend the conference. Launched in late October 2018, the registration process resembled a union organizing campaign. Members talked with members about the conference and assisted each other with an online application process. Invitations were provided so as to ensure the diversity of our local would be represented. In their geography, industry, employer, age group, and even in their perspectives and inspiration towards activism, conference attendees were incredibly diverse. In fact, a majority of the members attending this conference had never been to a union event before, and just under half were under the age of 40. Only some were union stewards. We have a feeling that might change. Local 401 members from the App and Communications team plan conference coverage. At every step of the way, union members drove this conference. Over 50 members participated in committees ranging from developing and delivering three thematic workshop streams, helping to register participants, and documenting and covering the conference using their communications skills. UFCW Local 401 President, Douglas O’Halloran, addresses the conference crowd. Conference attendees were also welcomed by Alberta Minister of Finance, Joe Ceci, who delivered the message that recent changes to Alberta’s labour laws under the Alberta NDP government were only made possible because of the activism of working people like Local 401 members. 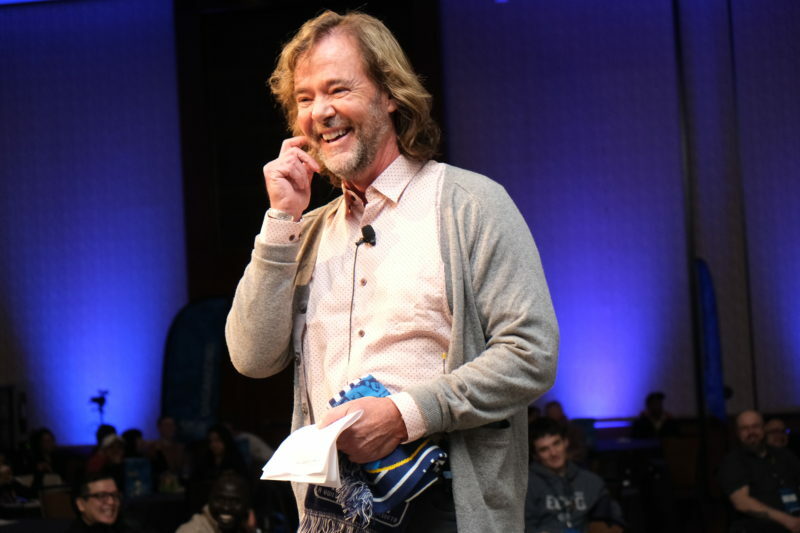 Local 401 Executive Director of Labour Relations, Tom Hesse, delivered a powerful presentation on why member engagement is central to a revitalized labour movement. Hesse likened the struggles of Local 401 members in their workplaces to Civil Rights struggles of the last century – from struggles for migrant workers’ rights to Local 401 contract campaigns to improve the material well-being of all working Albertans. Most of the effective and well-known social movements, Hesse explained, have their roots in the struggles of ordinary people finding the space to do extraordinary things. Hesse argued that unions need to be those kinds of spaces for people. Local 401 members delivered a series of presentations around the conference’s three main themes: workplace engagement, community action, and the importance of politics in the work of representing union members. Each of these presentations was developed and delivered by Local 401 members with the assistance of staff, which created an undeniable sense of energy, solidarity, and connection in the room. Plays, speeches, and animations entertained and inspired the crowd. UFCW Local 400 member, Courtney Meadows, delivers a spellbinding speech to Local 401 members. 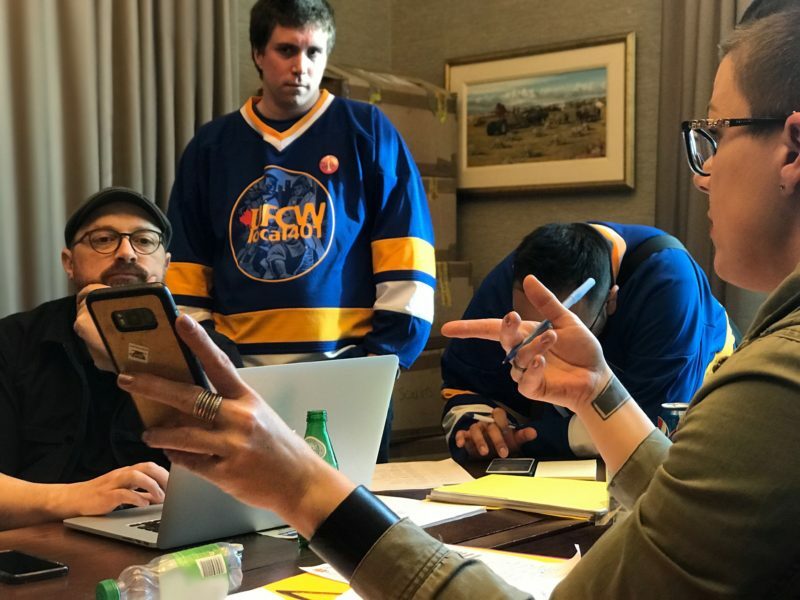 Conference participants were also treated to an orientation to the very first UFCW Local 401 Mobile App, a project long in the making and tailored specifically for the conference. Very soon, the Local 401 App will transform into an important tool for all Local 401 members, where they can gain access to important workplace information and be notified of union-related events. At the end of the first day, Alberta Federation of Labour President Gil McGowan delivered a well-informed and passionate speech about why Alberta workers need to be engaged in a province-wide conversation about the kind of province we want. He also shared details of Next Alberta, a new campaign to do just that. After a long day of travel and energetic presentations, some of Local 401’s most active committees hosted workshops and information sessions covering what our union is doing in the areas of positive community action, diversity and inclusion initiatives, and building community alliances. Without a doubt, Friday morning was the time when the conference was most jam-packed with speakers and excitement. After a blessing from Angela Fiddler, a UFCW member from the northern camps, President O’Halloran gave a presentation on the activism of UFCW International President, Marc Perrone, and Vice President, Stuart Appelbaum, both of whom were scheduled to attend but could not make it on account of airline issues. 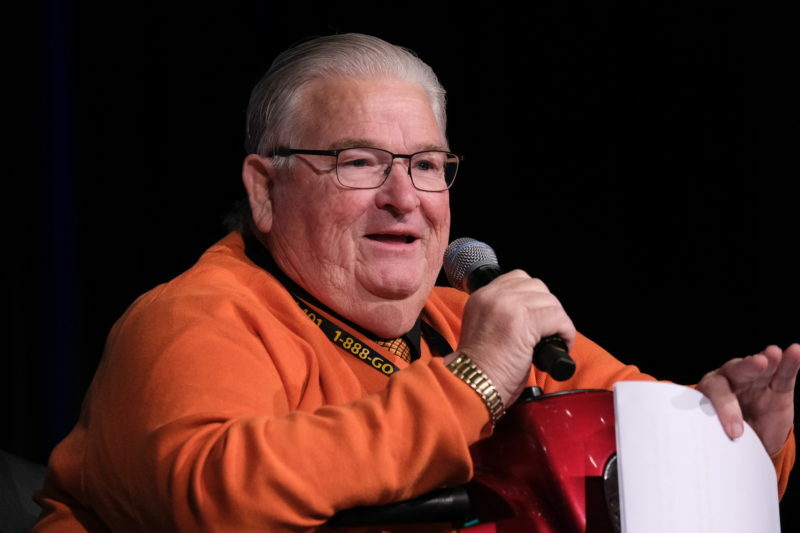 Later in the morning, UFCW Canada National President, Paul Meinema gave an inspiring speech about his own journey from being a shop floor union activist at the Fletcher’s pork plant (now operated by Olymel) in Red Deer in the 1980s to becoming the National President of our union. Meinema shared the important message that it is the spirit of solidarity that emerged from recognizing the experience of fellow union members – those who saw common cause in standing up for fairness – that allowed UFCW Local 1118, which recently merged with Local 401, to prevail against many of the most difficult employers in the industrial food processing sector. At the end of his speech, President Meinema invited Local 401’s leadership to share the stage with him and deliver an important message to Local 401 members: O’Halloran and Hesse spoke of the importance of sharing stories as tools for engagement and organizing, the importance of looking outside our comfort zones and experiences to learn about our coworkers and find shared cause with each other. As Local 401 members joined in chanting “it’s ours,” they created a truly electrifying moment. Just when we thought things couldn’t get any more energetic, Siobhán Vipond (AFL Secretary Treasurer) and Matt Gilks (UFCW Local 401 steward and camp worker) welcomed a very special guest to the address the conference, Alberta Premier Rachel Notley. As Premier Notley came to the stage, the excitement in the room was palpable. Local 401 members greeted the Alberta Premier with a standing ovation and a warmth that the Premier shared with them in her remarks. After experiencing presentations from three streams around the themes of workplace engagement, community action, and politics, conference participants used the Local 401 App to select their preferred area of focus for conference workshops and actions. This process was facilitated by conference co-coordinator and UFCW Canada representative, Marv Funk. Morning workshops helped to set up members for an afternoon of public actions across Calgary. Actions included visiting UFCW Local 401 workplaces and engaging union members while at work, volunteering for a local political campaign, and holding a flash mob at three locations in downtown Calgary. To illustrate just how fun these actions were, here’s a short video of the flash mob action, performed by participants of the Rise Up Community Action stream. 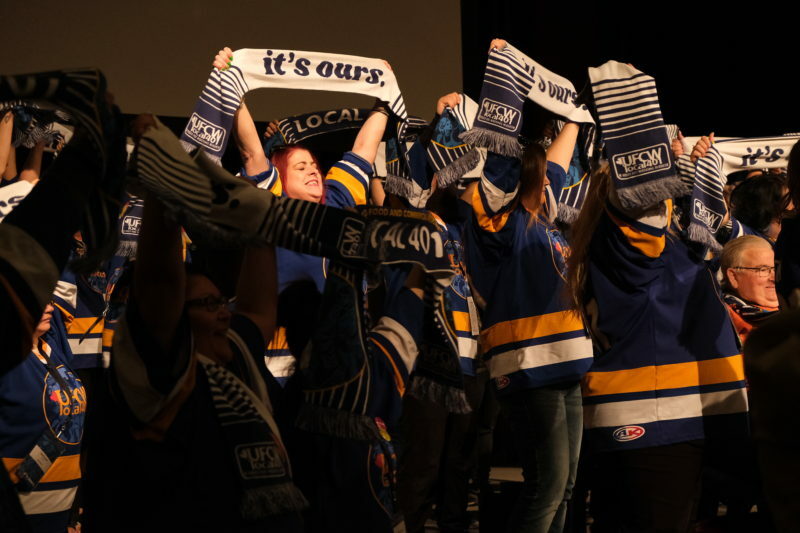 Check out this super fun flash mob action from the It's Ours Members' Conference 2019 last week! This was from the Local 401 Rise Up workshop stream. More conference coverage coming soon! After a long day of learning and action, we returned to the hotel for a fun evening. Alberta Minister of Economic Development and Trade, Deron Bilous, gave a speech about his own experience in community engagement and how that led to his desire to enter politics. Minister Bilous was followed by indigenous dancers, led by Chief Leonard Weasel Traveller, who discussed the connection between the work of union members and the strengthening of solidarity in communities. Theresa reflects on her storied career as one of Canada’s strongest union leaders. The conference also featured an important announcement and tribute. UFCW Local 401 Secretary Treasurer, Theresa McLaren, announced her retirement. 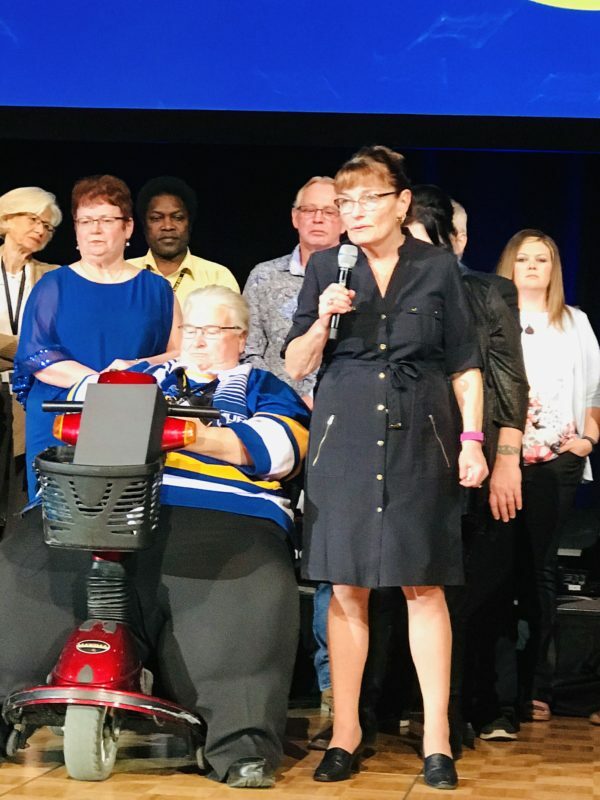 Amidst tears and hugs, Theresa was honoured by the UFCW Local 401 Executive Board, members, and staff for her decades of steadfast dedication and hard work for Local 401 members. It was widely acknowledged that Theresa is the “rock” not only of President O’Halloran but also of all Local 401 members who have had the pleasure of working with her. The final morning of the conference started early with a blessing from Local 401 member and relief representative, Charmaine St. Germain. There were then a series of report-backs from the three conference streams. One after another, Local 401 members shared their experiences from the activities of the conference and how those experiences influenced and even changed their perspectives. Members from the Workplace Engagement stream shared results from a survey they carried out in retail stores across Calgary during their Saturday action. Being St. Patrick’s Day, they also leafletted the crowd and handed out “Lucky to be Union” buttons. Final words were reserved for President O’Halloran, who closed the conference with heartfelt thanks and perspective. O’Halloran also pondered and pointed toward a strong future for Local 401 with emerging new roles for current Northern Director, Richelle Stewart, and current Executive Director of Labour Relations, Tom Hesse. He assured Local 401 members that their local would be strong well into the future and that his personal leadership would be there for some considerable time yet. With over 32,000 members, UFCW Local 401 is Alberta’s largest private sector union, bringing a voice to working Albertans in sectors as diverse as retail, food and beverage processing, entertainment, hospitality, healthcare, and education. 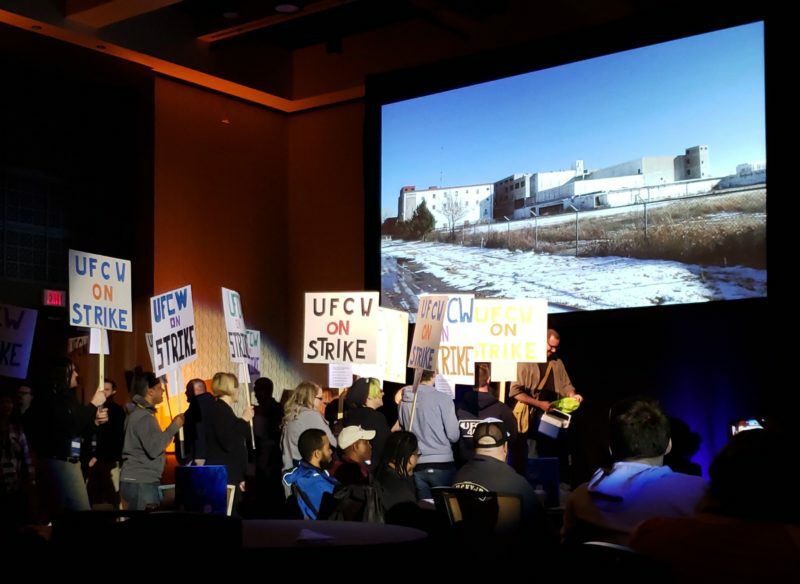 This article, including all the photos and content that accompany it, would not have been possible without the efforts of the very same UFCW staff and Local 401 members who made this conference happen.